This is a new entry at historycommons.org. Condoleezza Rice didn't deserve "more favorable" treatment. She belongs in prison. 9/11 Commission Executive Director Philip Zelikow tells the staff team working on the Bush administration’s response to terrorist threats in the summer of 2001 that their drafts must be rewritten to cast National Security Adviser Condoleezza Rice in a better light. Rice’s testimony about the administration’s prioritizing of terrorism has been contradicted by former counterterrorism “tsar” Richard Clarke, who said that al-Qaeda was not a high priority for the White House. The commission staffers think that Clarke is telling the truth, because, in the words of author Philip Shenon, Clarke had left a “vast documentary record” about the White House’s inattention to terrorism. Clarke’s account is also corroborated by other National Security Council (NSC) members, the CIA, and the State Department. At the amount of people that haven't seen this clip. I got it a long time ago from Michael Moore's Fahrenheit 9/11 DVD. It was one of the extras. The August 6th, PDB was one of the first things that REALLY made me take a hard look at 9/11. 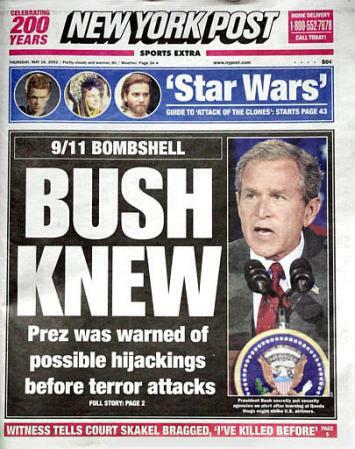 We were told again and again that there were "no warnings," and that no one had "any idea" that something like 9/11 could happen, and then news of a document entitled, "Bin Laden Determined To Strike In U.S." came out. The title is a warning in and of itself. It talked about how the FBI was "conducting approximately 70 full-field investigations throughout the U.S. that it considers bin Laden-related," and that they saw "patterns of suspicious activity in this country consistent with preparations for hijackings or other types of attacks, including recent surveillance of federal buildings in New York." Once I found out that we were lied to, I was "off to the races." You may remember that Bush said he requested the PDB because of threats in Genoa. Threats reminiscent of what happened on 9/11. You may also remember that Bush has said, "I don’t think anyone in this government [in] the prior government, that could envision flying airplanes into buildings on such a massive scale." He also said, “had we had any inkling whatsoever that terrorists were about to attack our country, we would have moved heaven and earth to protect America." So let's see, he requested a PDB because of threats from the air, was given the PDB that said there were "Al-Qaeda" inside the United States that might be preparing for hijackings or other types of attacks, and still had the audacity to say the types of things mentioned above. Not only that, but he didn't "move heaven and earth." He didn't even have the decency to GET THE HELL OUT OF THE CLASSROOM. It has been 7+ years since 9/11. Would you believe the August 6th, PDB was NOT the only warning this administration received? People think that the warnings are considered "limited hangout", or "LIHOP," but the fact of the matter is, the warnings they received might have come from honest people in the intelligence industry (ours, and around the world) that stumbled across something initiated by elements within our Government. Patty Casazza alleged that whistleblowers claimed they knew the day, the target, and the type of attack. If this is true, imagine the kinds of things they could do to insure the success of the attacks with that kind of information. Another important aspect of the warnings shows that they LIED. If they lied about that, imagine what else they lied about. Jon Gold on Thu, 10/09/2008 - 5:27pm. And what will be the consequences for Zelikow and the other 100 or so known main offenders? It would appear nothing. Flicker on Thu, 10/09/2008 - 6:48pm. Jon Gold on Thu, 10/09/2008 - 6:57pm. Zelikow certainly one of the top twenty suspects. He was perhaps the first PNAC/Neocon to use the "New Pearl Harbor" phrase back in the 90's. penguin on Fri, 10/10/2008 - 2:32pm. Looks like there is a a lot of damaging info from Shenon's book. Arabesque on Fri, 10/10/2008 - 12:32am. Should be NSC not NSA in the penultimate section. major US retaliation will be in order[.]" 249"
"Rice told us she took Clarke's memo as a warning not to get dragged down by bureaucratic inertia. 250 While his arguments have force, we also take Clarke's jeremiad as something more. After nine years on the NSC staff and more than three years as the president's national coordinator, he had often failed to persuade these agencies to adopt his views, or to persuade his superiors to set an agenda of the sort he wanted or that the whole government could support." Now, when you read that as a part of a 500+ page report, you might not fully realize what was going on here, but when you look at it in isolation, your reaction may be a little different. A "warning not to get dragged down by bureaucratic inertia"??!! And note the use of the casually disparaging word "jeremiad," which I had to look up. It's an absolutely stunning memo, but the commission just dismisses it. It wasn't the staff led by Bass and Hurley that did this, it was Zelikow. Kevin Fenton on Fri, 10/10/2008 - 1:46am. is the MotherTongue of the Necons and Neo-Liberals. constitutional911 on Fri, 10/10/2008 - 7:25am.